St. Mark’s Chapel is located on the campus of Bishop’s University and Champlain Regional College. This historic chapel was consecrated in 1857 by George Jehoshaphat Mountain, the third Anglican Bishop of Quebec. With funds collected by Jasper Hume Nicolls, the first Principal of the university, made it possible in 1874 to extend the original nave to the south and to add an apse. Fire destroyed the interior of the chapel in 1891 and the restoration work was completed in 1895. Carefully maintained and beautifully preserved, St. Mark’s Chapel was declared Cultural Property by the Quebec Ministère des affaires culturelles in 1989. It remains today as an important historical and artistic legacy of the long and significant role of Bishop’s University in the Eastern Townships region. 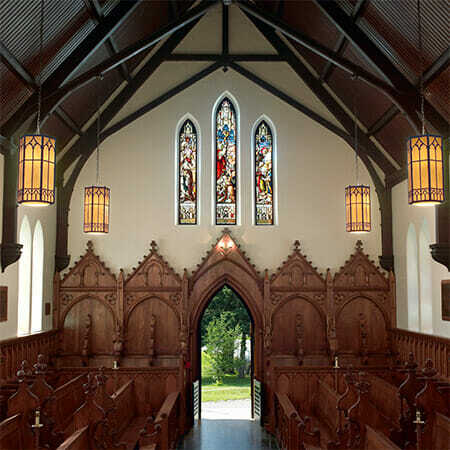 St. Mark’s Chapel is now an ecumenical chapel serving the Bishop’s University and Champlain College Community. Worship services are held at 10: 00a.m. on Sundays from September until June. Organ concerts are held several times a year and publicized through the local media. Morning Prayer is held each weekday at 8:15 a.m. during the academic year. Guided tours are available by appointment (819-822-9600 ext. 2718) and take about thirty minutes. Gather with others for Sunday worship with music leadership by Sarah Heath and the Chapel Choir. Everyone is most welcome to attend services in the chapel. Following the Sunday service there is a time of fellowship in the Cleghorn Common Room.